Redesigned for 2016, our adjustable upper control arms for the 2005-2017 Nissan Frontier, Xterra, and Pathfinder. Owners that have installed a 2" or taller shock spacer have experienced an annoying "clank" when the stock upper control arm contacts the coil shock mount on the frame. 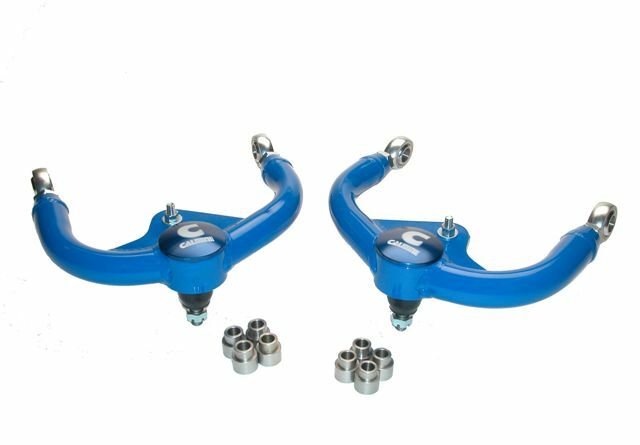 Our new replacement adjustable upper control arms correct this by providing extra clearance as well as being fully adjustable for correct Caster/Camber alignment after lifting. Made from 1.5" x .120" wall tubing, our arms feature the use of OEM style ball joint that provides increased misalignment for extra wheel travel as well as the safety of a double shear captured mount. The hi-end 4130 Nylafiber-lined rod ends are race quality and give better handling feel than urethane by reducing deflection under hard braking and side loading. The kit comes complete with Ball Joints installed and grade 8 hardware. Durable powdercoat finish. Minor trimming required on some models.